Triple B Street Tacos Anyone? 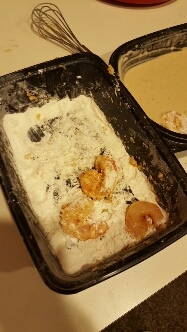 I marinated pre-cooked shrimp in Webers Siracha Garlic grill seasoning, salt, olive oil and few dashes soy sauce in the fridge overnight. 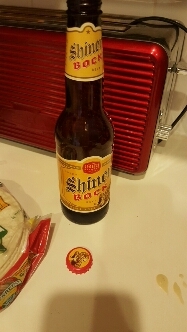 Take marinated shrimp and lightly shake in white flour, then coat in a beer batter made of half a bottle of Shiner Boch or any medium dark beer with a cup to a cup and a half of flour and wisk. 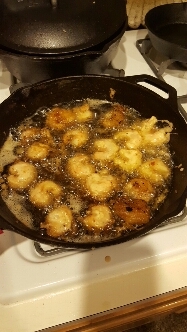 Once coated, heat cast iron skillet on medium heat with an inch of oil and fry shrimp until crispy. Chop scallion, cabbage, cilantro and create your own taco. So yummy! Restaurant Price $2.50 ea taco which was nearly $30 including chips n salsa for $1 and cokes. 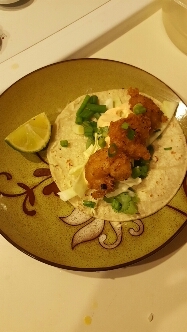 My own version cost me about $8 total using stuff on hand and half a pound of shrimp. Sunday is here and I’m extremely calm which rarely happens. I’m a person who is always worried about something. But this weekend has been amazing! My babydoll came home for the weekend after our first month of being newlyweds and I find myself happy, at peace, calm, and rested. It’s weird how a single person can bring everything good out of you and can without effort or purpose make you whole. 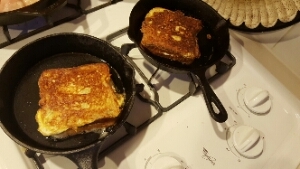 I got up this morning, made some coffee and made stuffed french toast. 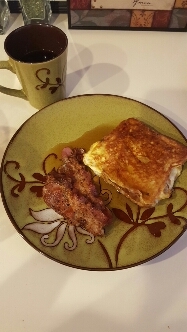 But not just ANY french toast… my homemade version. Babydoll, when he got home Friday night, brought with him a bag of food. When he is gone, he lives on his truck with a dorm sized fridge. I was putting things away and took the bananas out of the bag by the stem and the darn things came clear off! Now every banana was exposed and open at the tops. Grrrrrrrr, but no worries. French toast it is! Now 75% of the time, when i cook there is no recipe. There are no measurements or list of ingredients, just my experiments. Im a cook who knows what she likes, pays attention to good flavor combos and a lover of back to basics. So here we go. 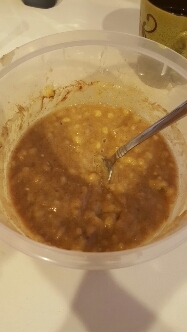 Take a bowl and mash bananas with fresh nutmeg, cinnamon, salt, and vanilla. 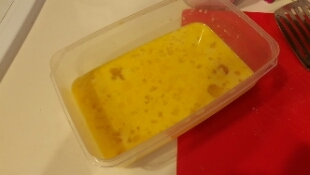 In a second bowl, beat eggs with salt and splash of milk. 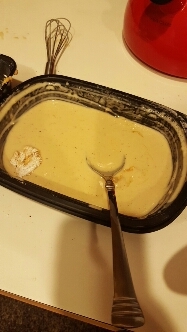 In a third bowl, mix a block of cream cheese, tsp sugar, vanilla, splash of milk until thoroughly mixed and borderline smooth. I like mine just a little chunky like the size of a grain of rice. 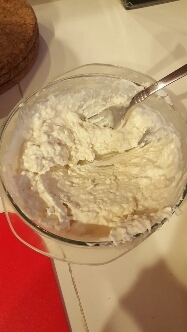 Take your bread, smear cream cheese on one side, put a spoonful or two of banana, place the other slice of bread on top pressing the sides and dip in beaten egg mixture. Just like a single piece of fresh toast. I had to use my two hands to transfer to my cast iron skillet because of the weight. 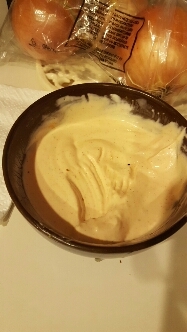 And browned it on both sides. The ONLY way to serve French toast is with REAL maple syrup and soft bacon while out on your patio in pjs and a slippers sipping coffee while inhaling the crisp scent of late fall. All while savoring a hot cup of coffee next to the one who takes all of life’s stresses away and thanking God for the blessings. My brooch bouquets were so stinkin easy to make. I’ve been scouring the Internet all year looking for an affordable brooch bouquet. Well….there aren’t any! The one I wanted that made my jaw drop was $599. Yup…not happening. So I researched how to make them myself! I found a dealer in California on Etsy that sells brooches in bulk packs of various quantities, colors, and sizes. I choose a lot of 60 silver rhinestone brooches and 50 purple amethyst brooches. Both brooch packs came as buttons not pinned brooches. This made it super easy to wire. I found faux bouquets on A Brides Bouquet website and went with simple roses. 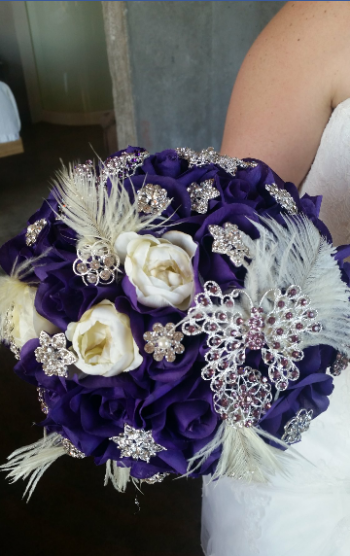 My bridal bouquet was two dozen purple roses and the bridesmaids had toss ivory bouquets. In total I paid about $80 shipped. I tore the ribbon off that they put under the bouquet and separated the flowers just a little. 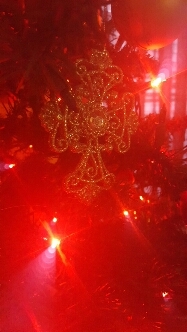 I took a button brooch and 22 Guage tarnish resistant wire I bought at Hobby Lobby and make elbow length strips of wire. Take a strip and fold it in half. Now put one end into the button loop and pull tight until the bent section of your wire that you just pinched in half. Twist very tightly about 2 inches the loosely the rest of the way. This make your brooch flowers. Do this to all the brooches you want to add. Note: some buttons will got stay sturdy enough due to weight on top and will flop. That’s ok, just take one more piece of wire bent in half, and find a hole in your brooch. Put into brooch from the top of the brooch down and twist tight, now gather with first wire and twist tight to create now a firmer wire stem. Note: Choose a wire that is the same color as your metal. That way you won’t see it at all. Also 22 Guage only. Any thicker will be hard to manage and make your bouquets even heavier to carry. Any thinner and you’ll need triple the wire on each elbow length instead of halves. Now create your bouquet as you like, secure with one hand and with your other hand wrap the rest of the wire tightly and evenly around your handle. This will thicken your handle so you can ribbon wrap it and make it really look like a bridal bouquet. Once you have your brooch stems in your bouquet, wrap the handle with floral tape securing all the wire to your handle. Now you can ribbon wrap it. 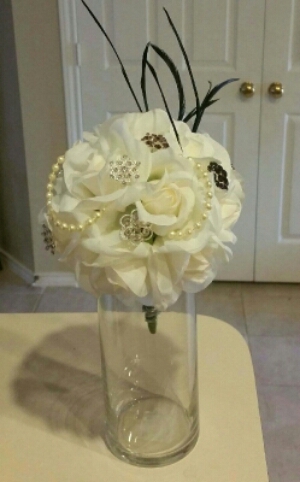 To finish my bouquets, I took leftpvers of other things ive used in other projects. The same ivory ostrich feathers leftovers from my centerpieces, ivory smaller roses from my bridesmaids hair pieces, strands of pearls as well as the skinny black feathers. But I did it!! I made them and they were gorgeous! 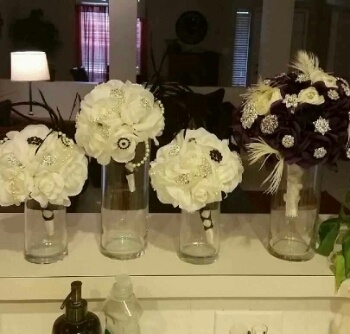 My bouquets cost me about $150-$160 for all four. On Etsy they get much much pricier and with shipping it’s even more. I did mine in one afternoon. And what’s better than a homemade bouquet where your girls can save as a keepsake or use the beautiful brooches for something else. Fresh bouquets are nice, but these will last a lifetime. Click here for my other wedding DIY!